Going along with the crowd: Why do we do it? It’s Thursday after work and you and your friends are looking for a new happy hour to try. Someone eventually pulls out their phone and searches for a place using their Yelp app. They quickly filter places based on customer reviews and off you go to discover somewhere new; Even though you’re not a huge fan of BBQ, the five star review and enthusiasm of your co-workers make you start to think that ribs don’t sound so bad. This type of behavior, being influenced by others, is something that we all do in a number of different forms -- from considering product reviews online to adopting the latest fashion trends to letting our friends convince us that another drink is a good idea. Therefore, an important question is: why are we susceptible to these types of social influences? It is often hard for people to accurately reflect on all of the things they were considering or thinking about when they were influenced, making this question difficult to answer. But studying the brain can help. Neuroimaging tools, such as functional magnetic resonance imaging (fMRI), allow researchers to look at peoples’ experiences as they happen in real time, without the need for the person thinking to reflect on their own thoughts. Using these techniques, neuroscientists have begun to contribute to our understanding of social influence. We recently reviewed this literature (Cascio, Scholz, & Falk, 2015) to highlight what the brain has revealed about susceptibility to influence, as well as how people successfully influencing others. A complementary recent review (McDonald & Crandall, 2015) on social norms and influence highlights the breadths of influence social norms have on social life, cognition, and behavior and some new ways to study influence. Social psychologists have shown that one main reason that people conform to social influences or social pressures is to maintain harmony among social group members (Cialdini & Goldstein, 2004), but it has been hard to distinguish whether people change simply to go along with the group or whether they actually change deep down. For instance, even if you disagree with your friends’ choice of the happy hour location, you may decide it is better to simply go along with the group decision to keep everyone happy. On the other hand, you might actually find yourself excited for something you’d otherwise not like. On the surface, it might be hard to distinguish which motivation was the driving force in your decision, which is where the brain can be especially helpful. The past decade of neuroscience findings highlight some of the key processes that support influence. First, in order for group harmony to exist, group members must have the ability to detect conflicts between their current behavior, preference, or choice and those of others. The (conscious or unconscious) perception of being misaligned with others may elicit distress, which in turn motivates people to adjust or realign their behavior or attitudes with those of the group. In fact, early neuroimaging studies on social influence demonstrated that changing behavior in response to group opinions that differ from the subject’s own is associated with increased activity within brain regions implicated in detecting conflict, as well as regions believed to encode ‘social pain’ (Berns et al., 2010; Falk et al., 2014; Klucharev et al., 2009; 2011; Tomlin et al., 2013). Taken together, these studies suggest that sensitivity to social conflict and distress in the form of anticipated or actual ‘social pain’ may contribute to conformity, such that individuals may conform to avoid negative social consequences and promote social bonding. In addition to conflict detection, our susceptibility to social influence may also result from the positive value placed on social relationships, which can provide pleasures such as the feeling of fitting in or winning approval from others. 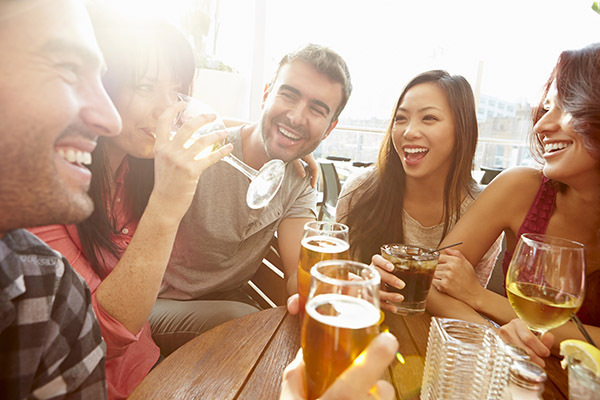 For instance, you might agree to the next beer during your happy hour not out of physical thirst, but because you expect that agreeing will help you to be part of the social interactions that are happening in your group and to gain social approval. In neuroimaging studies of social conformity, neural activity within reward and positive valuation regions has been implicated in changing one’s preferences to be in line with the opinions of others, suggesting the anticipated social rewards of group alignment, but may also indicate that people internalize the value other people assign to objects or ideas when they learn about other’s opinions. This, in turn, motivates people to update or change their behavior to be consistent with others in their group. Neuroimaging researchers interested in understanding behavior change have also begun to examine whether neural activity during persuasive message exposure can tell us something about future behaviors that occur outside of the fMRI context. For example, in our bar example—could neural responses to messages about drinking predict how many drinks you have next time you are at the bar? These studies largely focus on regions involved in how much messages resonate with us personally. In fact, researchers have used neural activity within these regions to successfully predict future changes in sunscreen use and smoking behaviors. Perhaps even more interesting, researchers have also used activity in these neural regions to make predictions about the success of regional health campaigns. These findings demonstrate that the brain may provide useful and unique information about behavior, even at the population level, that is not captured in reports of attitudes and intentions. Finally, in addition to studying those being influenced by social information, neuroscientists have also started to consider the perspective of the influencer (how good are you at convincing your co-workers to try out the new restaurant you love?). Although this research is still relatively new, existing studies highlight the importance of activity in brain regions involved in understanding the mental states of others, deemed mentalizing, in communicators who effectively influence others. Initial studies have found that increased activity in mentalizing regions in the brain has been associated with greater success influencing others. In other words, such work seems to suggest that you might have better luck convincing your friends to choose your favorite happy hour for your night out if you spend a few minutes considering their perspectives, likely desires and thought processes and integrate them into your persuasion strategy. Cascio, C. N., Scholz, C., & Falk, E. B. (2015). Social influence and the brain: persuasion, susceptibility to influence and retransmission. Current Opinion in Behavioral Sciences, 3, 51-57. McDonald, R. I., & Crandall, C. S. (2015). Social norms and social influence. Current Opinion in Behavioral Sciences, 3, 147-151. Berns G. S., Capra C. M., Moore S., Noussair C. (2010). Neural mechanisms of the influence of popularity on adolescent ratings of music. Neuroimage, 49:2687. Cialdini R.B. & Goldstein N. J. (2004). Social influence: compliance and conformity. Annu Rev Psychol, 55:591-621. Falk E. B., Cascio C. N., O’Donnell M. B., Carp J., Tinney F., Bingham C. R., Shope J. T., Ouimet M. C., Pradhan A. K., Simons-Morton B. G. (2014). Neural responses to exclusion predict susceptibility to social influence. J Adolesc Health, 54:S22eS31. Klucharev V., Hyto¨nen K., Rijpkema M., Smidts A., Ferna´ndez G. (2009). Reinforcement learning signal predicts social conformity. Neuron, 61:140. Klucharev V., Munneke M., Smidts A., Ferna´ndez G. (2011). Downregulation of the posterior medial frontal cortex prevents social conformity. J Neurosci 2011, 31:11934. Tomlin D., Nedic A., Prentice D. A, Holmes P., Cohen J. D. (2013). The neural substrates of social influence on decision making. PloS One, 8:e52630.